Public Transit in Ottawa: What might Surrey's transit funding request mean for Ottawa? 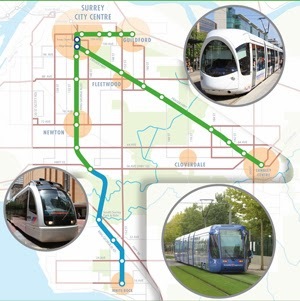 What might Surrey's transit funding request mean for Ottawa? The City of Surrey is in the Metro Vancouver region of British Columbia, and it boasts a population of less than half a million people. It's also hoping to embark on a massive light-rail project to bring the city together, not unlike that Ottawa city council has recently approved. For their part, Surrey recently applied for $1.8B in federal funding for their plan, and they expect that--if approved--they'd receive about one-third of that (which is in line with historical funding agreements between the three levels of government). That would equal about $600M from the feds--the same amount they pledged to Ottawa for the first phase of this city's light-rail transit system, which is under construction now. Apparently TransLink, the provincial transit authority for Metro Vancouver, is advocating an extension of the SkyTrain further into Surrey in combination with bus-rapid transit, while Surrey city council favours an all-light rail system in the city. Each option is roughly $2.2B (SkyTrain/BRT just over, LRT just under). The province is considering a regional referendum in Metro Vancouver to determine priorities for TransLink, which--as one might expect--has concerned Surrey, considering the relatively small population and large spread of the municipality. But setting aside provincial and regional politics on the west coast, Surrey's ask is an interesting one because of the potential influence it has on other decisions. Ottawa, which is a municipality twice as large as Surrey, received $600M from the feds some time ago, and is now beginning to spend it on the first phase of the light-rail plan. But Stage 2, that plan's second phase, is slated to begin construction immediately after completion of the first stage and expand LRT service in three directions at a cost of about $2.5B. That $2.5B price tag sets the stage for a near-future federal funding ask of another roughly $830M, plus the equivalent from the province. In proportional terms, it's not far off what Surrey is asking for their plan, so it might not be as much of a reach as it seems at first glance. Supposing, of course, that Surrey's request gets support from the federal government.